Cy Twombly is one of the true giants of American post-war painting. An heir to the Abstract Expressionists, whom he encountered in New York as a young man, Twombly’s paintings married their introspective search for the self with literary, art historical and classical allusions that speak to the broader human condition. He is best known for his graffiti-like mark making, which he often used in conjunction with handwritten words and quotations. Over the course of his long career, Twombly produced paintings that range from the languid, ethereal and elegiac, to the frenzied and carnal. He also created bodies of sculptural work redolent of classical architecture and ritual objects using predominantly found materials. Born in 1928 in Lexington, Virginia, Edwin Parker Twombly, Jr. was nicknamed after the baseball great Cy Young, as his father was before him. Yet Twombly inherited none of his father’s athleticism, and instead showed a keen interest in art and classical studies as a boy. After training at the Museum of Fine Arts in Boston and the Washington and Lee University, Twombly moved to New York in 1950 to study at the Art Students League. At the League he befriended Robert Rauschenberg, who encouraged Twombly to study at the progressive Black Mountain College in North Carolina. The pair then travelled together through Europe and North Africa in 1952–53. The journey had a profound impact on Twombly. It fuelled his taste for antiquity and left him with a sketchbook filled with motifs that would form the basis of his new expressive abstract paintings. While drafted into army service from 1953–54, Twombly fostered an automatic, untutored method of mark making by drawing in the dark. Subsequent works, such as the immense white-on-black Panorama of 1955, emphasise the process of drawing and the calligraphic quality of line. Among the anxious scrawls and painterly palimpsests that followed, basic signs and words began to appear. 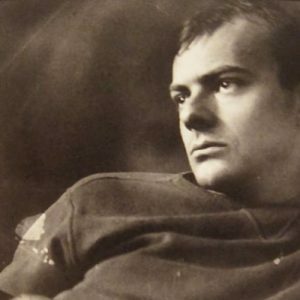 In 1957 Twombly abandoned New York – by then the epicentre of the art world – to take up residence in Italy, where he would remain for the most part, with frequent trips to the States. The impact of Twombly’s adopted home on his art is felt in the unbridled sexual energy of his richly-coloured ‘Ferragosto’ paintings of the early 1960s, in recurrent mythological references such as Leda and the Swan, Venus, Apollo and Achilles, and in his frequent tributes to the beauty of the Mediterranean landscape, as seen in the ‘Quattro Stagioni’ cycle of 1993–95. Twombly was a deeply private artist who rarely spoke publicly about his work. Major retrospectives organised by the Whitney Museum in 1979, Kunsthaus Zürich in 1987, the Museum of Modern Art, New York in1994 and Tate in 2008 have helped expose his lyrical and highly emotive oeuvre to generations of appreciative audiences, as has the Renzo Piano-designed Cy Twombly Gallery at The Menil Collection, Houston, which opened in 1995. Far from resting on his laurels in old age, Twombly continued to create ever-more powerful works, including the exuberantly gestural ‘Bacchus’ series of 2005 and the radiantly colourful flower paintings of 2007–08. In the final years of his life, Twombly’s regard for the grand narrative of art history, and his status within it, was further acknowledged with a commission to paint a ceiling in the Louvre (the first artist given this honour since Georges Braque in the 1950s) followed by a dual exhibition with paintings by Nicolas Poussin at the Dulwich Picture Gallery in 2011.